In this second part of our how to windsurf guide, we will take you through an exact plan of action that has over the years proven to work most effectively in taking someone who has never windsurfed and turning them into a proficient windsurfer in the least amount of time. In our How To Windsurf Guide – Part 1 we gave you the basic steps to take before even getting out on the water, including physical physical preparation, mental preparation and focused training exercises. Read back over part 1 of our guide to windsurfing, to make your first windsurfing experience much smoother & more enjoyable. 1. Make your first step be taking windsurfing lessons – The point we touched on in part 1 of our how to windsurf guide, about taking windsurfing lessons, is really the starting point for your focused training. Without formal windsurfing lessons you could literally go years before you become half decent at the sport. Windsurfing is one of the best sports I know but due to the nature of its components you have to combine a lot of skills all at the same time to achieve results. There is the board balance, sail control and wind awareness which all have to be mastered and developed at the same time. 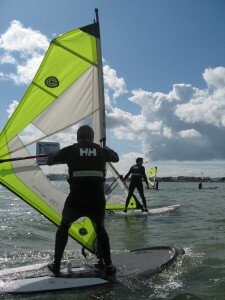 A good length for a full beginners windsurfing course is 2 lessons of 3 hours each. This will give enough tuition so that you are armed with the skills and knowledge necessary to then take things into your own hands for a while and practice what you have been taught with some supervised windsurf hire. If possible, find and read some testimonials from other satisfied windsurfing students who have been to the windsurf school you are thinking of using. Positive feedback from past windsurfing students is always a good sign that your chosen windsurfing school is doing a good job. 2. Fine tune your skills with supervised windsurf hire – Stay committed to your learning by signing up to a windsurf rental program designed to maximise your progression. The biggest mistake people make when learning any new sport is to loose focus after the initial experience. People often have every intention of continuing with their new found passion but never put in place a plan of action to continue their development. It is very easy to let things slip when you have a busy schedule, yet out of everything, sport & leisure is what we should always be prioritising – quality of life and all that! A really good way to keep your focus after your initial beginners windsurfing course is to get yourself on a windsurf hire scheme, a 10 hour discounted hirecard will roughly give you the amount of ‘on-water’ time needed to consolidate your skills before moving on to an improvers windsurf course. Obviously the amount of time it takes to feel competent with the basics varies from person to person & also depends on your chosen windsurfing location and weather conditions but generally anywhere from 10 to 20 hours of ‘on-water’ time will give a really good foundation in windsurfing. 3. Push your learning to the next level with improver windsurf lessons – Its all very well getting past the basic steps of windsurfing but to really unlock the sports potential you need to top up your knowledge with some improvers windsurfing lessons. Once the beginners windsurfing lessons and initial supervised hire time are under your belt its time to learn the intermediate stages of windsurfing. These intermediate windsurfing courses are best taken in 2 hour modules, where your instructor can focus on one or two essential skills (beach starts, harness, faster tack, gybes, stance, etc). With focused training you can quickly master these improver windsurf skills, 2 hours of instruction mixed with supervised hire time in-between to really get to grips with the new skills you have been shown. After an initial 2 hour lesson, practice is essential, don’t move on to another module until you are either happy with the skills or feel you need to go back for a refresher lesson on the same skills. There is absolutely no harm in taking a few lessons on one particular improver windsurf skill, such as beach starts, to make sure you really do have it mastered! 4. Continued training with more practice and lessons – In between each of your improver and subsequent advanced windsurfing lessons you should hire windsurfing equipment to consolidate your learning. Hiring windsurfing equipment also gives you a great opportunity to test out different size boards & sails, so that should you want to buy your own windsurfing kit at some point, you will have a fair idea of what suits your size & current ability level. So, that’s an overview of how to plan your windsurfing training, maximising your progress and fun! In our How To Windsurf Guide – Part 3 we will give some top tips for learning the basics of windsurfing, including getting into the start position, making static 180 degree turns, achieving a good sailing position and steering up/down wind.